Rebonding and smoothing are two hair treatments that make your hair look straight, soft and sleek. 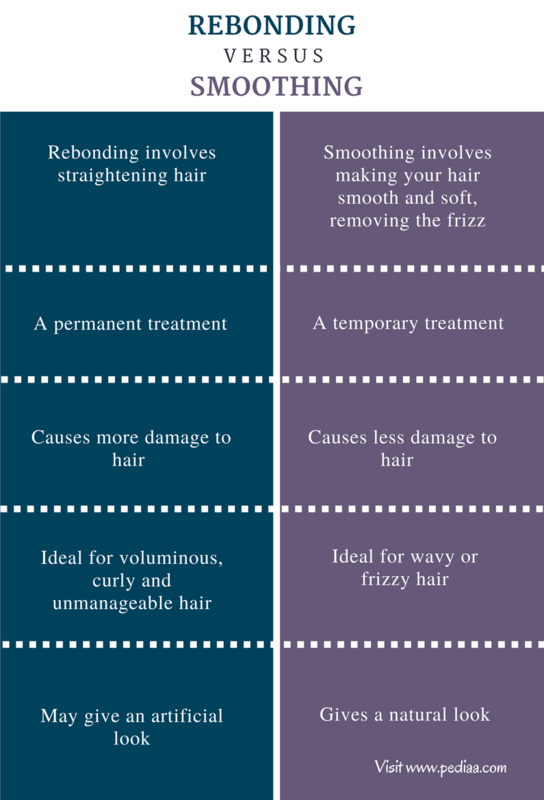 However, there are many differences between rebonding and smoothing. The main difference between rebonding and smoothing is the type of hair they suit; rebonding gives better results for people with thick, curly and untamable hair whereas smoothing is more suitable for those with wavy or frizzy hair. 3. What is the difference between Rebonding and Smoothing? Rebonding refers to the process of chemically relaxing your hair, making it look soft, sleek and straight. Rebonding method mainly depends on chemicals to straighten the hair. The natural bonds in the hair are broken by softeners or relaxers. Then these bonds are restructured using neutralizers. The name rebonding refers to this process of rearranging the natural bonds. Rebonding is a permanent treatment since it affects the structure of the hair. It may last as long as a year, but this mainly depends on the time your hair takes to regrow. Rebonding can be done for any hair type though it is more preferred by people with curly, voluminous and unmanageable hair. This treatment is a long process and needs to be done very carefully since chemicals can cause damage to your hair and skin. It is advisable to get this done by a hair stylist who has proper training. Rebonded hair also needs a lot of hair care compared to normal hair due to all the chemical processes it has undergone. Smoothing refers to the process of making your hair soft, smooth, straight and manageable while removing frizz from the hair. This hair treatment is ideal for those who have wavy or frizzy hair. Even people with straight hair like to do this treatment since it smoothes the frizz from the hair. However, this may not work well for people with thick, curly, untamable hair. Smoothing is a temporary process, and the results will last for about 4 or 5 months. Protein treatment and Keratin treatment are two ways of smoothing hair. When compared to rebonding and straightening, smoothing produces a more natural-looking effect; it is also less damaging to hair. So if you want to improve the texture of your hair without causing any changes to the natural hair structure, it is better to go for smoothing. It will make your hair look smooth, silky and natural. Most hair stylists recommend hair smoothing over straightening and rebonding in most cases. Rebonding: Rebonding involves straightening hair. Smoothing: Smoothing involves making your hair smooth and soft and removing the frizz. Rebonding: Rebonding is a permanent treatment. Smoothing: Smoothing is a temporary treatment. Rebonding: Rebonding may cause a lot of damage to hair since it involves chemicals. Smoothing: Smoothing causes less damage compared to straightening and rebonding. Rebonding: Rebonding is ideal for people with voluminous, curly and unmanageable hair. Smoothing: Smoothing is ideal for people with wavy or frizzy hair; this might not work well for people with curly and untamable hair. Rebonding: Rebonding may result in an artificial look. Smoothing: Smoothing results in a natural look.